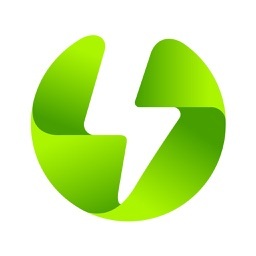 Zap-Map: EV charging in UK by Next Green Car Ltd.
by Next Green Car Ltd.
Zap-Map enables EV drivers to locate and navigate to charging points across the UK. 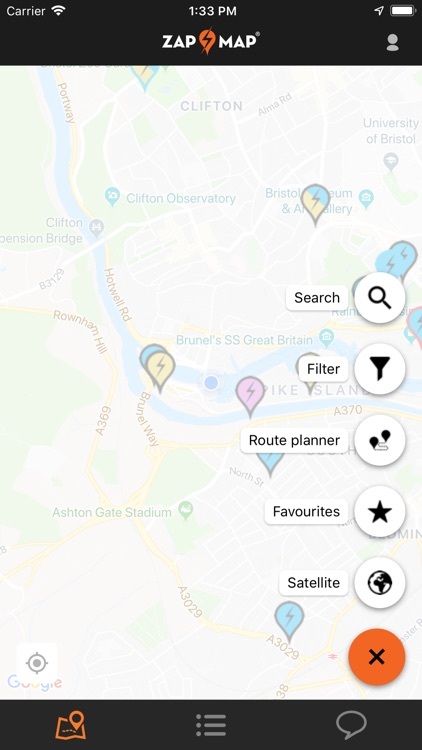 With over 6000 locations, 11000 devices and 19,000 connectors mapped, Zap-Map shows charge points from both the major networks and smaller providers across the UK and the Republic of Ireland. 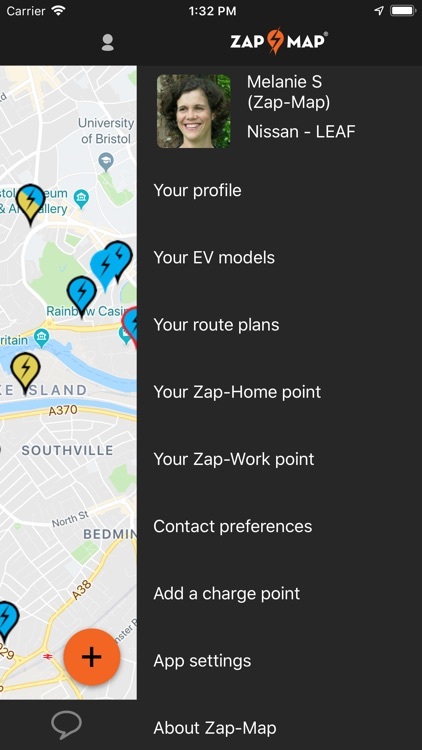 With live status data from many networks, an active user base and many features including a route planner, Zap-Map is the go to app for EV drivers. - Map showing 6000+ electric car charging locations, 11000+ devices and 19,000+ connectors across the UK and the Republic of Ireland. Updated regularly through dynamic network data feeds, Zap-Chat community layer and desk research. 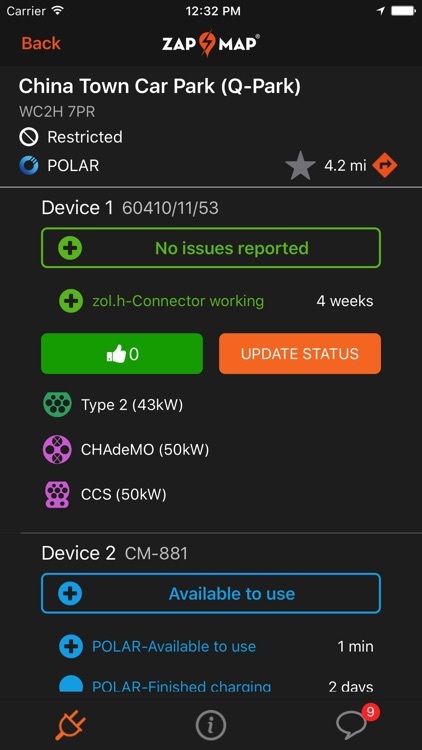 - Dynamic network status is available for points on the POLAR, Charge Your Car, GeniePoint, Source London, ESB EV Solutions, ecarni, ESB ecars, EV Driver, TfL, Franklin Energy, ubitricity, char.gy, Engenie and Alfa Power with more networks being added shortly. Status updates now show both network dynamic status (in blue) plus latest update on the charge point from Zap-Map users or network bots. 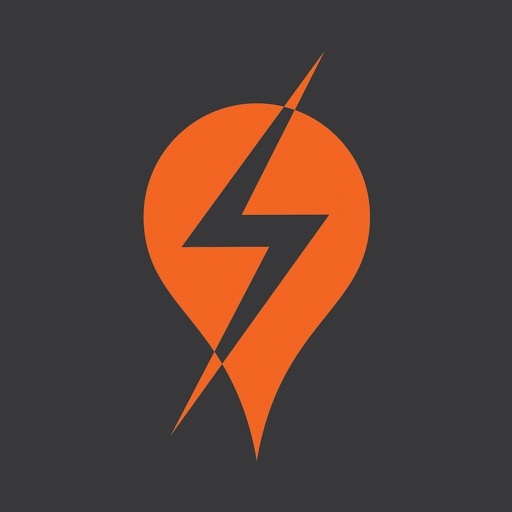 - Route planner allows you to locate suitable stops on your electric journey. 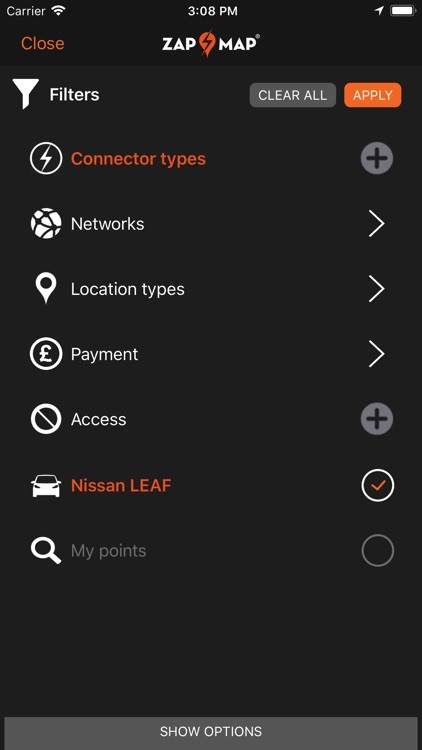 Default to the standard settings for a 'quick plan' or adjust the driver and charger search options to create a customised plan. 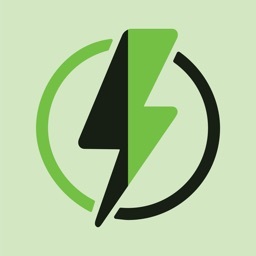 - Community feature “Zap-Chat” allows you to add successful charge, update charge point status, report ICEd, add photos/comments and "last mile" info for the benefit of the EV community. Zap-Chat now also has a "cafe" area where you can ask questions or chat with other Zap-Map users. - List view of the above, including the charge point's distance from your current or chosen location. 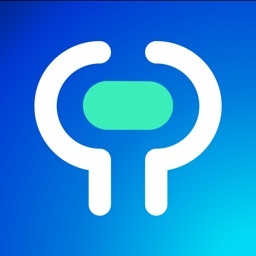 - Advanced filters enabling filtering by any combination of connectors, speed, network, location type and access. - Favourites facility allowing you to view your favourites on the map or a list on any device. 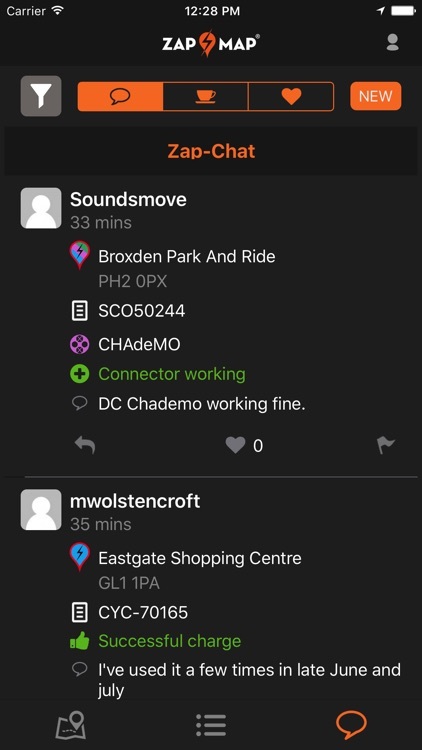 Use the favourites filter on Zap-Chat to see any new comments / status changes on your favourite points. 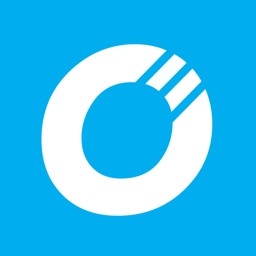 - Zap-Home / Zap-Work - add your Home or Work charger to Zap-Map to enable peer to peer sharing for free or a small charge. Ability to add photos and directly edit information held. - Add a public point - add new points through the wizard, points will be reviewed by the Zap-Map data team and then added to Zap-Map. 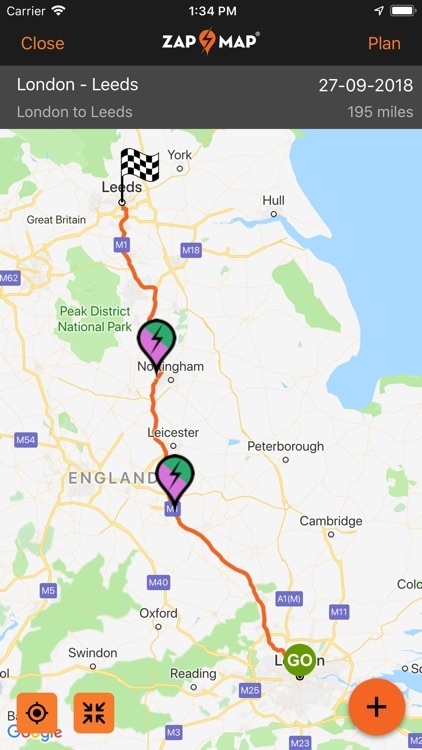 Zap-Map, providing charging point information in the UK since 2011, is focused on providing the best data, tools and community to help new and experienced EV drivers get the most out of their electric vehicle. 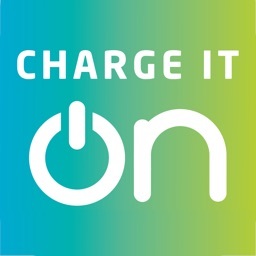 Fortum Charge & Drive B.V.